After breakfast and a conversation with one of our neighbors, we moved upstream with the Middle Fork. We were seeing a great many people on the trail, and a large percentage of them were doing the entire Muir Trail this year. When we reached LeConte ranger station, we met the ranger at his cabin as we ate a meal nearby. He noted that three 'bad bears' were in the area, noting Dusy Basin and the area around Big Pete Meadow as high-risk spots. 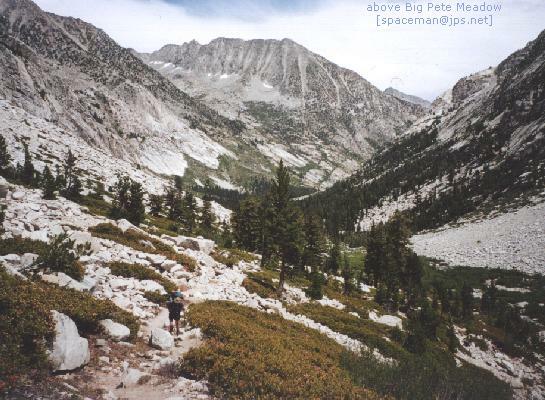 We were planning to be well above Big Pete, so we continued uphill. A group of eight or so were matching our pace, doing the South Lake to North Lake tour. We sped up and were alone soon, but we were soon overtaken by now-familiar storm clouds. These looked serious, so we sought a place to hide near the lowest lake in the upper basin. By the time we found a good place the cloud had blown by (on its way to drop snow on hikers at Muir Pass), and blue sky was appearing again in the south. Pleased by our good fortune, we continued up, passing a camp with three llamas grazing in a small meadow. We continued on to the next high lake and found room for two tents well above the water. The weather was having a rather serious effect on our wash routine by now. Each afternoon had been cloudy and cool, so we were forced to delay washing clothes until at least one other outfit had a chance to dry. We again washed some things and hung them out, and this time the late-day sun was actually able to dry an item or two. After dinner I wandered back down stream to visit the llama camp. I suspected that the woman camped there was an acquaintance from the Yahoo! outdoor clubs. She remembered me as the one who sent her images of llamas from my 1998 hike in the Wind River Range, and we talked for quite a while about our travels. I then returned to camp where Scott and I each had a lousy night's sleep despite our weariness.